Central Teacher Eligibility Test (CTET) 2019 (सीटीईटी ऑनलाइन फॉर्म की तारीख, पात्रता मानदंड, परीक्षा तिथियाँ उपलब्ध) Aspiring candidates can apply for the CTET 2019 Application Form which is conducted by Central Board of Secondary Education. Candidates, who will qualify in the Central Teacher Eligibility Test, will be appointed for the Teaching Jobs in Schools. The Selection will be depended on the candidate’s application process. Candidates who will complete the CTET 2019 Online Application in a successful manner and this application form will be accepted by the Exam authority then they will eligible for the Exam Process. Basically, the CBSE hold the CTET Examination twice in a year and conducts the two papers. 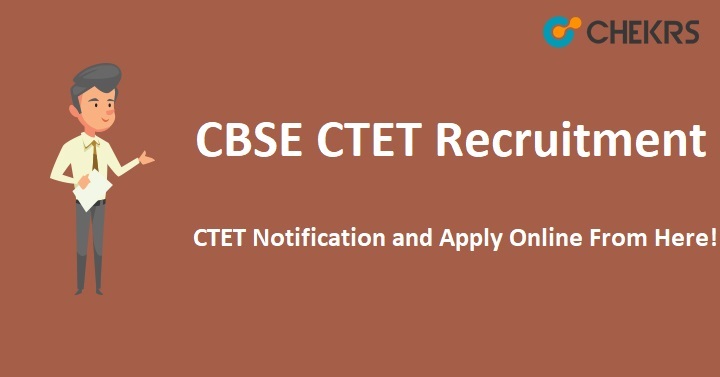 Eligible candidates can check the CTET Exam Date 2019, Eligibility and more information from here. All the candidates will have to make sure that they complete all the four steps. After completing the application process, the CBSE will generate the CTET 2019 Admit Card for the Paper-1 and Paper-2. The Paper-I will be conducted for the Class 1to 5th Class Primary Teacher and Paper-II of CTET will be organized for the Class 6th to 8th Elementary Teacher Posts. Before going to apply Online, candidates must check their CTET Exam Eligibility details for the available posts. First Download the Bank Challan and pay an amount of equivalent to the examination fees (Non-Refundable) in any branch of the selected Bank. You can also pay the application fee in the online mode through the Debit/ Credit Card/ Net Banking etc. Before going to complete the Registration process for the Primary and Elementary Teacher Vacancy, candidates need to check the Eligibility condition which are given the below. The candidates who are applying for classes 1st to 5th teacher must have passed senior secondary with at least 50% marks and passed or appearing in final year of 2 years diploma in Elementary Education. Senior Secondary with at least 45% marks and passed or appearing final year of 2 years diploma in Elementary Education according to the NCTE. Senior Secondary with at least 50% marks and passed or appearing in final year of 4 years B.El.Ed. Senior Secondary with at least 50% marks and passed or appearing in final year of 2-year diploma in special education. Graduation with at least 50% marks and passed or appearing 1 year Bachelor in Education. Hit on the Apply Online Link. Fill all mandatory information such as Educational, Personal etc. Candidates can deposit the application through another way i.e. online mode. Before submission, check the all filled details. After click on the Submit button and can rake a print out of application form for the future uses. The candidates want to get more information about CTET 2019 Online form they may visit our website that is www.jobs.chekrs.com. If you have any query that you can write comments on the commenting box and take a review or feedback.